"He's perfect. But I ought to operate for the experience." - The Insurance Doctor (Oliver Hardy) in Should Sailors Marry? While the team of Laurel and Hardy is legendary in comedy history, both Stan Laurel and Oliver Hardy had solo careers before they were teamed by the Hal Roach Studio. Stan's solo period was rather more successful, since he was frequently starring in his own comedies, while Ollie was generally relegated to supporting roles. But the rotund comedian nonetheless had over 250 short comedies to his credit before he became a fixture with Stan. 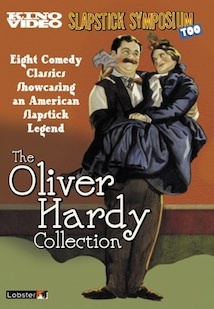 This DVD features eight two-reel comedies from Hardy's solo career, which give a sampling of his work. The least of the set are two dreary Larry Semon comedies, The Show (1922) and The Saw-Mill (1921). Hardy plays the typical heavy (no pun intended) in both of these and has little opportunity to show his stuff. Semon tries on a dual role in The Show, but doesn't stretch the concept as Chaplin had in the similar A Night in the Show (1915) and Keaton's extraordinary The Playhouse (1921). He does, however, manage some startling Keaton-like stunts, such as running a locomotive through a house. The Saw-Mill is chock-full of random violence, but it is utterly lacking in any sense of timing or humorous rhythm; watching these shorts makes one understand that what made slapstick work was not evident to all its practitioners. Two Bobby Ray comedies are present, Stick Around and Hop to It! (both 1925). Ray stars as "A Goof" and his character is not terribly dissimilar to that adopted by Stan in his teaming with Ollie. The interaction between Ray and Hardy in Stick Around, where the two play wallpaper hanger, seems like a clear template for the later teaming, with Hardy overbearing, pompous and in charge, while Ray hopelessly screws things ups. Hop to It! finds Ollie as an out-and-out villain, a bellhop who wants to steal a wad of money from wealthy traveling man Frank Alexander, while fellow bellhop Bobby Ray is more interested in pretty saleswoman Janet Dawn. These comedies are fairly brisk and offer some good laughs. Glenn Tryon stars in two comedies, Along Came Auntie and 45 Minutes from Hollywood (both 1926). He has an earnest character rather like that of Harold Lloyd. Along Came Auntie is one of two films on this disc dealing with problem ex-husbands; in this case the ex- is Hardy, but wife Vivien Oakland has to hide the fact of her divorce and remarriage to Tryon from her wealthy aunt, Lucy Beaumont, lest she be cut out of the will. When Hardy is taken in as a boarder and then coerced into taking part in the charade, things get pretty wild. It's one of the most entertaining shorts on the DVD. 45 Minutes from Hollywood is most famous as the first teaming of Stan and Ollie in a Hal Roach picture; they would team up for good the next year but here their presence is practically accidental. The story centers on Tryon attempting to get to Hollywood to make a payment on his mortgage and running into the stable of Hal Roach stars, including Our Gang and others (plus Theda Bara). Stan shows up as a thief in a giant James Finlayson-like moustache and shares screen time with Hardy only for a few moments. Hardy finally gets a lead role in Crazy to Act (1927). Ethel St. John (Mildred June) is wooed by wealthy Gordon Bagley (Hardy) and poor Arthur Young (Matty Kemp). Ethel has dreams of acting, and promises Gordon she'll marry him if he makes her a star. With more money than sense, he complies, and the resulting film is quite uproarious. One suspects that this might be an offhand slap at Marion Davies, who was well known to have been financed by lover William Randolph Hearst. In any event, it's quite well done and provides lots of laughs. The other short on the disc is the equally funny Should Sailors Marry? (1925), featuring Clyde Cook as Cyril D'Armond, a sailor who becomes a mail order husband to Verbena Singlefoot (Fay Holderness) so she can pay alimony to ex-husband Milford Singlefoot (Noah Young), a wrestler who happens to also board with her. Before long, the exes have taken out an insurance policy on the hapless Cyril and contrived a variety of fatal accidents to befall him. It's hardly fair to consider this a Hardy film, since he doesn't show up until 13m into the 19m running time, and when he does he's onscreen as the insurance doctor only for a few minutes. But the short is too good to disregard even if it's not the best example of Oliver Hardy's solo work. It's a somewhat uneven collection, and the supporting roles don't really give one a chance to get a good sense of Hardy's onscreen abilities during the early 1920s. For the most part he's playing stereotypes and stock characters, but when he does get the chance to shine (as in Along Came Auntie and Crazy to Act), there's more than a glimmer of the talent that would become world-renowned. Image Transfer Review: The full frame picture generally looks quite good. The prints are provided by Lobster Films, and they generally have an excellent greyscale and detail, with minimal damage. That's especially true when you compare them with other releases; Along Came Auntie previously appeared on The Lost Films of Laurel & Hardy Volume 3, and the improvement here over that disc's wobbly, worn and contrasty picture is phenomenal. The transfer of 45 Minutes from Hollywood, on the other hand, appears to be very similar to the one in that series (which was also provided by Lobster), since both are derived from the camera negative. The one downside that this disc has is an improper PAL/NTSC conversion, which causes ghosting on several frames out of every five and unnecessary softness and blurriness during more rapid action. That's very regrettable because these are otherwise exemplary prints. Audio Transfer Review: Eric La Guen provides piano scores for the eight films, and they're exceptionally fluid and fluent renditions that capture the onscreen mood beautifully without mickey-mousing at all. The recording quality is quite fine, with no hiss or noise; the sound appears faithfully reproduced as is appropriate for a modern recording. Extras Review: There are no extras. Each film is given four chapter stops, which is significantly better than one usually finds on two-reel comedies, and there's also a handy 'Play All' button should you wish an uninterrupted three hours with Ollie and friends. An interesting if uneven selection of a few of Oliver Hardy's solo roles, with beautiful restorations, albeit subject to PAL conversion artifacts. The audio is quite fine, but there are no extras.